A family's life made better with mindful parenting and a little sign language everyday. 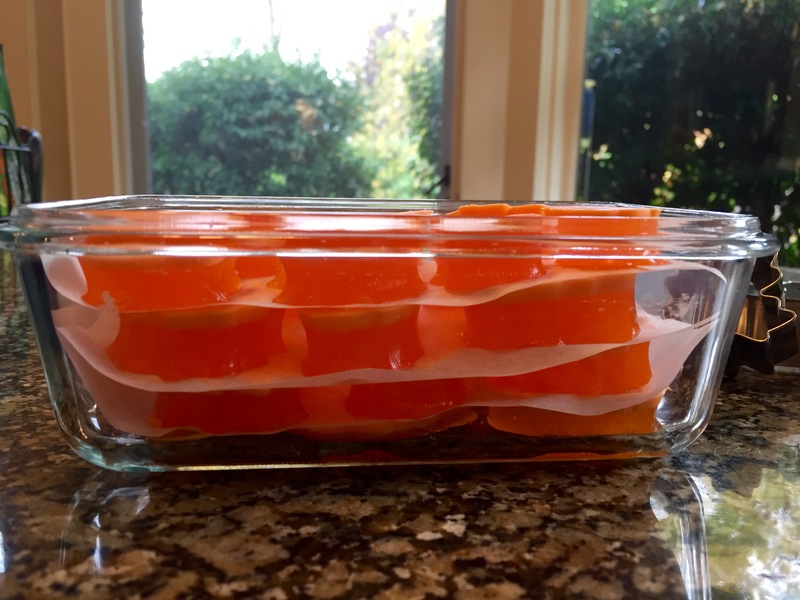 It’s Thanksgiving weekend here in Canada and my mother-in-law asked me to bring some of my Jello Bites to eat alongside the pumpkin pie at Thanksgiving dinner. Jello bites are little cut-outs of jello that can be eaten with your hands. Also called Jello Jigglers, this jello treat is made with less water than the usual recipe to make it more dense and jiggly. This adapted recipe for jigglers has a creamy layer too. But don’t panic, you don’t actually make 2 layers, this recipe mixes once and sets with 2 layers on its own. Hooray for small victories! I first tried these cut into squares at my lovely neighbour’s house almost a dozen years ago and she generously shared the recipe with me; I’ve been making them ever since! 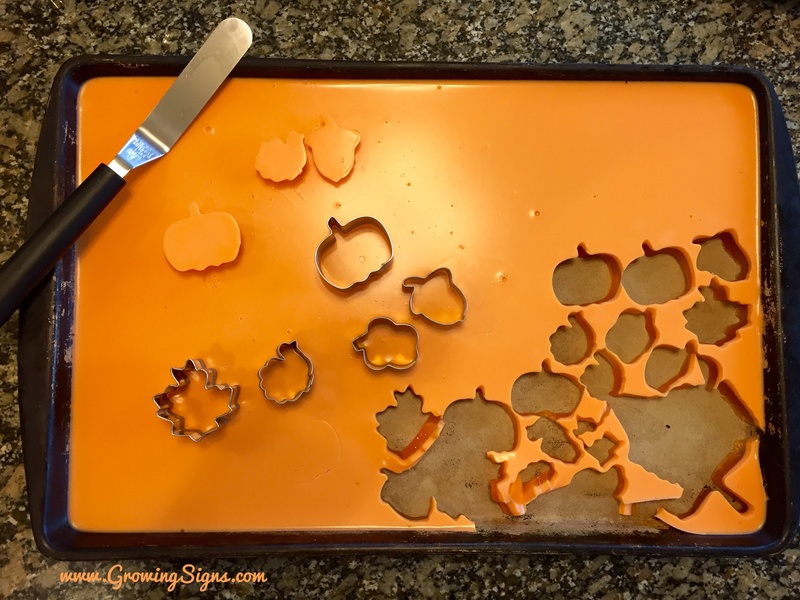 I use cookie cutters to make them cute for whatever theme is happening -birthday parties, school events, even Thanksgiving! My kids love these wiggly, jiggly, creamy bites of jello (and my mother-in-law, too)! They’re great for little hands with chubby fingers to hold and gobble up on Thanksgiving, or any time at all, give them a try! Pour the jello and gelatine crystals into a large heat-proof bowl. Slowly add the boiling water and mix well. Slowly add whipping cream into bowl and stir until blended. It may look a little globby as it blends, but it always sets evenly. Pour mixture into a 9×12 lasagna dish or deep cookie sheet and cover with plastic wrap. The jello and cream layers will form naturally as it sets. Let set 3-4 hours, then cut with cookie cutters or into squares with a knife. I pack them up in containers with parchment paper in between each layer to store in my fridge, ready for bringing to parties, school celebrations, and Thanksgiving dinner! Happy Thanksgiving, my Canadian friends! Learn how to sign more Thanksgiving signs in American Sign Language, too! Little ones have *big* feelings!! Show the ASL sign for EXCITED when you see their eyes lighting up about something you’re doing or about to do. Take a tiny moment to name things as you experience them. Show the sign & say our words out loud as you’re signing them, it’s one of the best ways to further language acquisition. 👁‍🗨TIP: for feelings signs like EXCITED, stopping to show that -you’re-excited is a terrific way for babies to learn the sign. They learn watching our expressions and exclamations: “I’m so EXCITED that daddy’s home” or “I hear the garbage truck, mommy’s so EXCITED!” (is it just our house that freaks out about trucks?). ✨✨⚡️✨🚚✨⚡️✨ 〰️To sign EXCITED, move your extended middle fingers on both open hands up and down in front of your chest, like jumping beans! 🎉 P.S. I’m EXCITED to meet new families today for beginner classes starting at @circusplaycafe 2pm, drop-ins welcome. See more at link in bio.